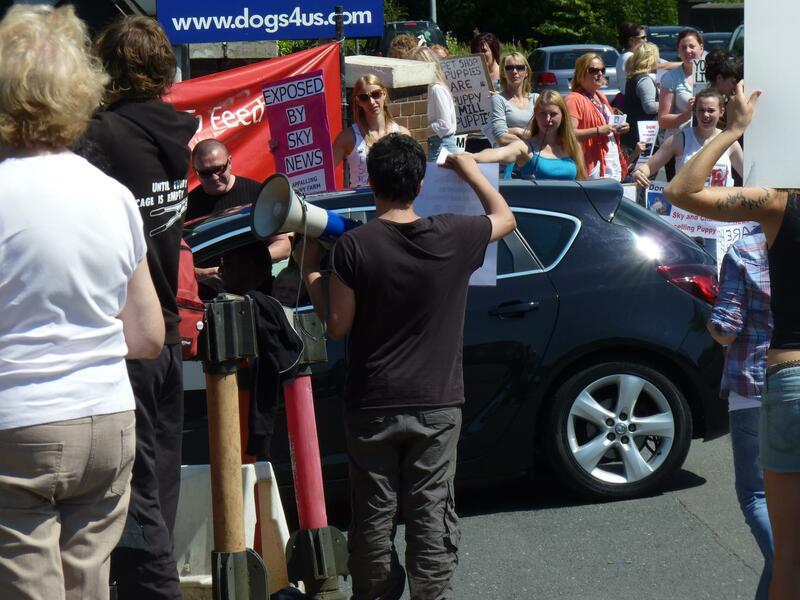 Around 45 protesters attend Dogs4us protest, massive public support! 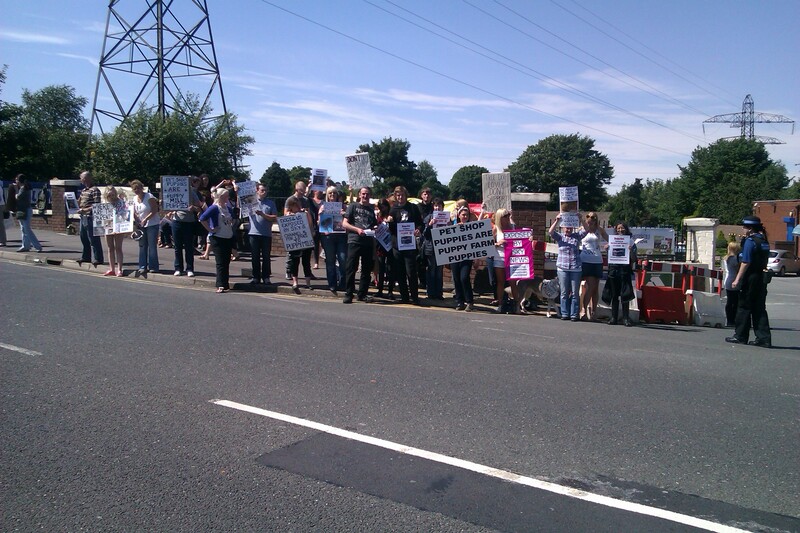 Yesterday (22nd July) around 45 protesters (over the course of the day) protested Dogs4us in Manchester. This is over double the lower end of our pre-protest estimate of 20! Loud and direct the protest had tons of public support. 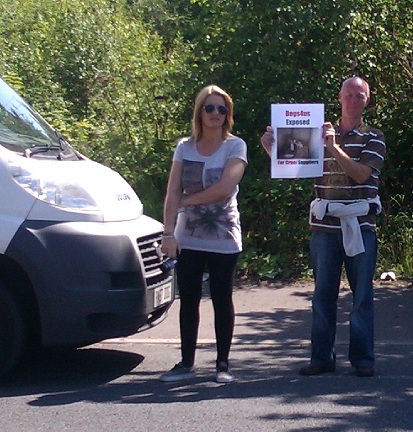 The road was awash with noise as cars tooted to show their disgust at Dogs4us dirty business. Refreshments were brought by locals that wanted to show support for the campaign and other passers-by joined the demo. 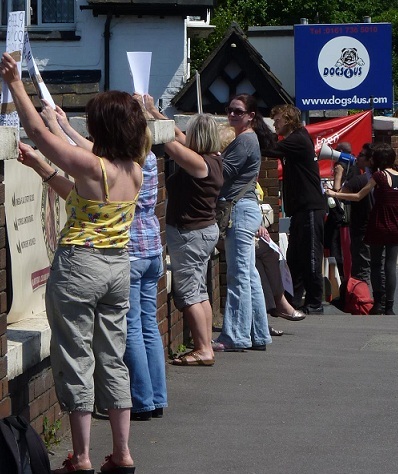 Members of the public and the few customers Dogs4us actually had, read the signs and leaflets about the Sky News and Channel 5 expose showing the cruel conditions dogs were kept in at a breeder that supplied Dogs4us. The megaphone was used to let people know that the Government recommend that you only buy a puppy if you can see the mother and that no so-called ‘responsible’ breeder would sell to a pet shop. Sacha (the son of the Dogs4Us owner) who came out to photograph the protesters ran back inside Dogs4Us when activists went up to say ‘hi’ (assaulting an activist on his way). Then he cowardly sent his girlfriend out to take photos of the protesters while he hid inside! Interest in the campaign continues to grow with over 60,000 views on the YouTube video showing the Sky News investigation of Dogs4us. Pledges to boycott continue to overwhelm the campaign and protest numbers continue to be strong. Dogs4us…. it is time to stop selling puppies! Shame on Dogs4us, I will be boycotting. Wow. I used this place for dog food. Never again. Saw the protest. This is shameful. I will boycott from now on. Saw the demo look really good, very loud, I will be supporting the campaign! I was walking past with my 2 children and saw you guys. I have been to Dogs4us before for supplies but what I saw totally disgusted me. I saw a security guard standing in a protesters face and when the protester asked him politely not to touch him the security goon shouted “what you gonna do about it”. All the security looked like thugs and I dont want them anywhere near my children. I wont be going back to Dogs4us and after seeing your website I agree they need to be stopped because of animal abuse as well. Thanks everyone for your messages of support and for taking the time to voice your disgust at Dogs4Us for supplying puppies bought from puppy farms, the way they treat the puppies that they have bought, the way they treat disgruntled customers who are unhappy with their purchase .. and of course .. the way they treat the people who care about the puppies .. so much so .. that they are willing to travel great distances .. to stand outside their premises and inform the public of the cruelty that goes on .. The level of support that we recieved from passing members of the public and local people was really fantastic and continues to grow each and every time a demonstration is organised .. a big THANKYOU to everyone of them 🙂 ..
Our message to the owners of the store is very simple and very clear .. Your selling of puppies will not be tolerated !! Your treatment of people who care enough to speak out against the vile industry from which you purchase puppies from .. will not be tolerated!! Untill you stop selling puppies .. THE DEMO’S AGAINST YOU .. WILL CONTINUE!! I got a leaflet with this website address on, after watching the video I have to say I do agree with what you are saying. It is a shame this is even allowed to be legal. I shall try and come and support you lot at the next demo. After reading alll these coments on here I agree that this place should go, esp. Mr Matthews comment,, I got a leaflet from u on the way out of dogs4us on sunday willl not be going back thats for sure. i didnt agree with you lot when i saw you protesting but i have been reading dogs4us blog – they seem really crazy the way they attack you lot, they have nothing to say about their own business clearly so i now agree with you. wont go back to dogs4us ever.